All our courses are carried out under the banner of THINKING SERVICE. This means that all academic studies are integrated with practical ministry and life transformation. At Perth Bible College, as well as nurturing students for their own growth and ministry, we empower and equip them with the tools and skills to train and develop others in their faith and ministry. 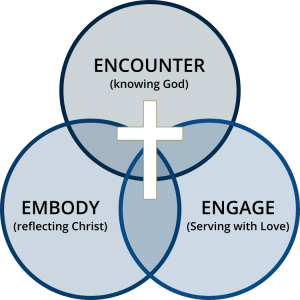 Embedded in our training are the following three core components that we believe are essential in preparing our students for a life of serving Christ. We aim at providing students with the opportunity to come to encounter the living God through worship, prayer, College life, and through having a solid understanding of his revelation to us in Scripture. Students will also be taught to interpret God’s Word faithfully and theologically. PBC provides constant opportunities for the training to impact the student’s lives, so that they are not only informed but transformed to reflect more of Christ’s character. This occurs through the course content, the College community life and practical involvement in church ministry. We prepare students for a Biblical ministry. This enables them to view people with eyes of faith, to offer themselves in authentic relationship and service, to understand the reality of this world, and to engage the world with God’s love. Students are equipped to be effective communicators of God’s truth in many contexts and given the relevant practical skills for a life of ministry. Many of PBC’s courses allow for students to take elective units from the different ministry areas to structure their course to best suit their ministry outcome desires. PBC offers students an environment which encourages involvement with ministry as they become a part of the College community. The College community provides students with opportunities to participate in small student discussion groups outside of the classroom, lead devotions, share in ministry forums, be involved in actively serving one another. Units as much as possible provide opportunities for students to put what they learn in the class-room into practice. The Advanced Diploma and Degree courses include practical placement components. PBC has also over a number of years conducted overseas mission trips, and plans to continue to offer this opportunity to students to provide a wider exposure to the work of mission around the world.